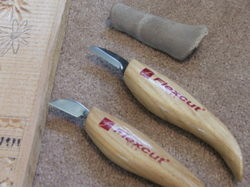 Annette asked (ever so long ago, I'm afraid) what tools and types of wood that Benjamin uses for woodcarving. He carves with a Flexcut KN12 carving knife. It has a nicely shaped and sized handle for a young person and it has served him quite well. It is the topmost knife in the following photo. The bottom knife is relatively new to him. It is called a chip carving knife and is used to remove small pieces of wood from the surface of a carving. There are some free beginning tutorials here and here. Ben wears a thumb guard as seen at the top of the photo. It is a heavy leather and has saved his hand many times. We highly recommend wearing a thumb guard. After slicing his hand once, he no longer forgets to wear it. Carvers can also wear a glove on the hand they do not use for carving. Ben's pair is pictured below. 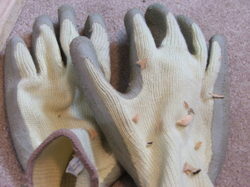 They have a non slip rubber coating covering a Kelvar glove. You can find some inexpensive safety items here. 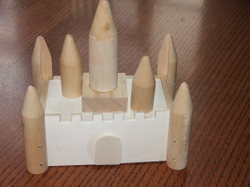 Regarding the type of wood used, chip carvers traditionally use basswood or butternut as they are lightweight. Here is some information on different types of carving wood. 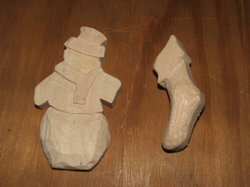 Ben has been working with a man who is teaching him chip carving. 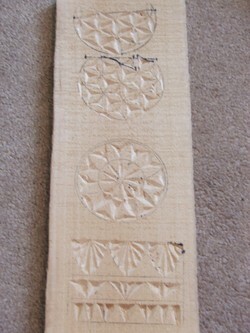 This is his first project, an array of drawn patterns to practice chipping out. It is so fun for me to watch him learn something completely of his own interest and skill. 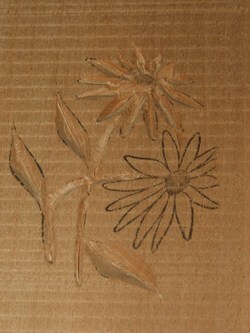 I do not know how to carve wood, other than to whittle the bark off of a stick. 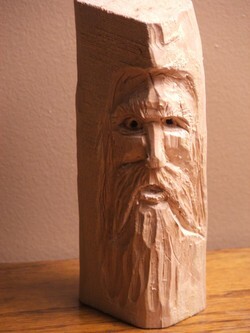 :) Ben has gained such satisfaction and confidence from his experience with carving. Thanks for visiting this weekend! 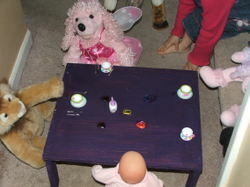 I thought you might like to see the some of the children's recent woodworking projects. Here is a bird feeder that Benjamin made following directions from the book Easy Carpentry Projects for Children by Leavitt. It will be mounted on a pole and used as a platform feeder for the birds in our backyard. He has made a number of these feeders in the past and has given them as Christmas gifts with a small bag of birdseed in the middle. 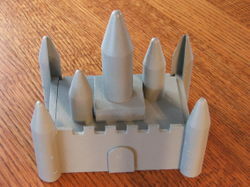 Here are some castle banks that the boys made from kits. Ben left his natural wood while Christopher painted his gray. Both boys so enjoy woodcraft. They've made some nice keepsakes and gifts over the years. 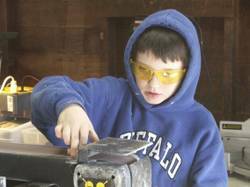 There is a list of helpful books in my sidebar if you are interested in learning woodworking with your child. On the first Saturday of every month, the boys head over to Home Depot for the morning. The store offers a three hour time slot for children and their parents to make wooden toys or other useful items from prepackaged kits. There is usually quite a turnout. It is fun to see kids of many ages hammering and painting to their hearts content. The children are given a work apron to take home and receive a pin for each project they complete. The woodworking session is free of charge. 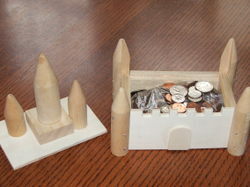 This week Christopher made this art caddy for his sister Annie. When Ben was four years old, we gave him a hammer, a two by four and a couple dozen nails. He was content for a long time, hammering away in the basement on his little workbench that I had picked up at a Montessori school sale. He has always enjoyed all things artistic but really seems to have found a niche working with wood. He has made several projects over the years including a little table for his sister, shelves, wooden toys, bird houses and a mail organizer for Mike. Here he is sanding some wooden figures in the wood shop in our garage. Very few tools are necessary to begin carving wood. Ben uses a Flexcut KN12 knife and wears a thumb guard. 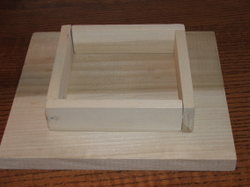 He also finds it helpful to use a non slip rubber pad (similar to those used to open jar lids) to hold the wood in place so the project does not move around while working on a table. It is a good idea to start learning under the direction of an experienced carver. Ben took a beginning woodcarving class at a local woodcraft store, for one afternoon. The class was intended for adults but the instructor was welcoming to well behaved, older (ten and up) children who were serious about learning to carve. There are also woodcarving clubs in most cities who meet monthly or more often. Many of the members are retirees who are more than happy to pass along their knowledge and experience working with wood to younger carvers. 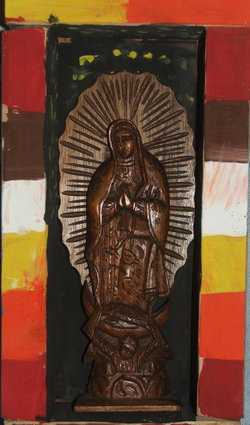 It is helpful to see other people's work by attending woodcarving shows where local artists can exhibit their wares on display or for purchase. 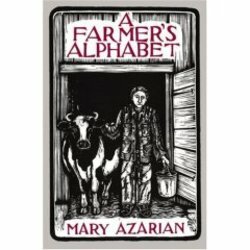 If you are interested in exploring woodworking or woodcarving with your children, I have listed some books in my right hand sidebar.